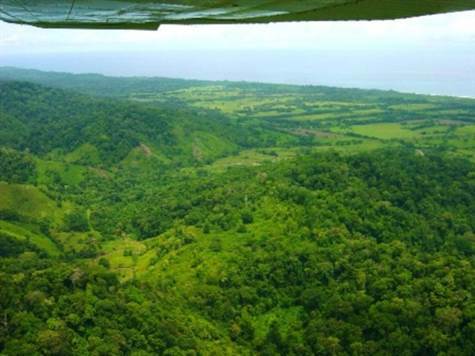 This pristine eco development parcel is located about 35km south of Puerto Jimenez and about 1/4 mile off the main government road set amidst the amazing bio diversity of the Osa Peninsula. The property consists of 165 acres ( 66 hectares) of mountain/ranchland and rolling hills with numerous ocean, farm and monutain views. The parcel has internal roads already cut and power to the edge of the property. The amazing panoramic elevated ocean views set less than mile from the Golfo Dulce make this property a prime location for an eco resort, estate home community project, eco farm project, sustainable community concept or any of a dozen similar uses. A complete and updated survey on the entire property was done 18 months ago. The property is fully titled, in a Corporation, up to date on all taxes, and currently has a full time caretaker on site. This area of the Osa has long been a magnet for, and prime location of, several high end Eco -Lodges beautiful homes and unique projects taking advantage of the natural surroundings. This parcel is close to Corcovado National Park, surfing at Cape Matapalo and Pejeperro Lagoon/wildlife refuge, making it a natural location to take advantage of tourist traffic found in this area of the Osa. The current owners are negotiable as to price and several financing options are available. Please contact me in order to arrange a showing, answer questions or provide further information.